Holiday Inn in Eureka, Missouri has one of the most unusual ghost stories around. The property used to be a large farmhouse with a barn that dated back to the late 1800's. During construction of the hotel back in 1970's, attempts were made to demolish the stone chimney from the old house. Each time they tried, something would go wrong with the machinery or somebody would be injured. After many unsuccessful attempts, the workers gave up and refused to try. Eventually the hotel was built with the chimney left standing. It is still standing there today. The second and third floors are haunted by little girl named Aggie. You can see her painting in the hallway that she haunts. Witnesses have seen her running down the halls and peeking around corners. You mY lao see her in the huge mirror in the lobby. Rumor has it she fell from the barn two stories down. 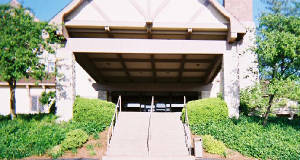 This is where the lobby is located. When building the hotel, workers used some of the limestone from the existing structures for the motel. Could this be the reason why she haunts that particular area? She has also been seen near the swimming pool. While taking pictures for thier brochure, a blurred figure showed up in one of the pictures. Proof of her existence? Maybe, maybe not. While investigating the motel recently, I found out the story of the ghost found lying in bathtub by some older women is not true. A man had apparently tried to committ suicide but was found and saved. Apparently some people tried to embellish the story. Right across the road is Six Flags. There are three known ghosts to inhabit the park. The first one is of a little girl that has been running around and laughing in various places. It's possible this could be Aggie. The second is Stella, who haunts the theatre, giving off cold spots and whispering to people. The third is the "Pigman." he's been spotted on the back service roads late at night. Some employees have claimed to hear pigs squealing in the distance. Just down the road from the Holiday Inn, Is the Eureka 6 Cinema. Not much is known about this haunting. When closing at night, employees have seen a face peering down at them from the projection booth window. This occurs when the booth is closed and locked. A Civil War skirmish is thought to have occured in the area, which may explain the ghost. Former employees at the local Burger King have also seen a soldier in a confederate uniform there. If anyone has any more information on these stories, please email me.